As a busy mom, I'm always carrying someone's Gatorade, water bottle or snack everywhere. Sometimes I have to keep everything cold, which means I need a cooler. But I don't want to lug around a big, ugly plastic behemoth cooler. I'm not a guy who is going to tailgate. What mom needs a big red cooler to wheel around everywhere. I'm a mom and I want to look cute with all my goodies. Igloo has a great collection of soft side coolers that are equally fashionable as functional. What I love about these coolers is that they look like a large tote. No one would know that you have bottles of Gatorade or a six pack of soda. It looks like I have a casual purse or fitness bag with me. Also, these coolers would be perfect for a day at the pool or beach. The style is fun and fashionable while being totally functional.Your goodies stay cool without a worry. Plus, you longer worry about your friends thinking that you have your husband's fish cooler. These stylish totes scream for the in the know woman. With these cooler totes, you can set the trend at your next summer bash. 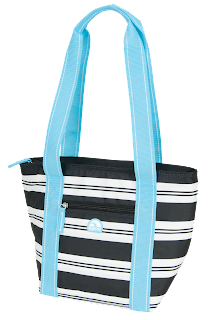 There are a variety of styles and sizes of cooler totes. Starting in May, the Mini Tote 8, Cooler Tote 16 and Shopper Tote 30 are available at Walmart and will be available at walmart.com beginning in May. Don't be boring. Show your friends and neighbors that you are in the know. Get a cooler tote from Igloo. All your mom friends will follow your trend setting cooler fashion. Disclosure: Igloo sponsored a prize for the Mother's Day Giveaway. For more information, please see www.more4momsbuck.com/disclosure.